Been another two weeks since my last post. There have been a few things going on around the garden – but not enough to make another weekly update. I’ve also been incredibly busy with other things lately as well. Alright, let’s get back to the garden. 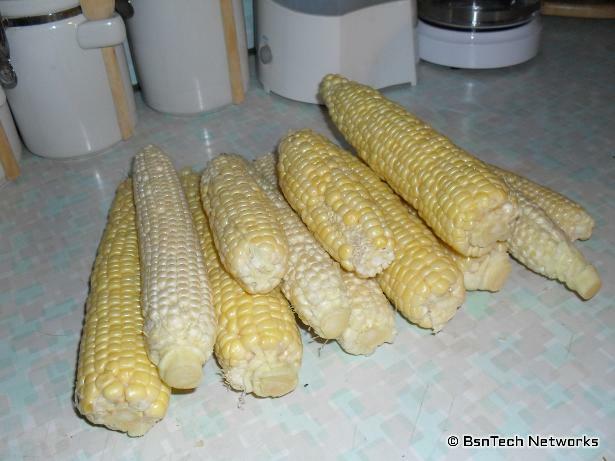 The week that we were putting the office together, we had quite a bit of Honey Treat sweet corn. So much so – that I’m impressed with this hybrid – but unfortunately they discontinued it. Off of about 12 stalks, we had 23 ears of corn. Yes, almost an average of two each! Last year we were lucky if we got one ear of corn for every TWO stalks. It looks like they are multi-colored – but this is a fully yellow hybrid. 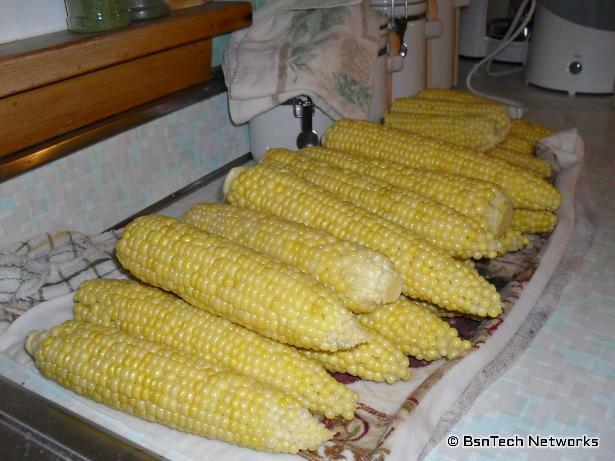 We always boil the corn right after it is pulled off of the stalk for a good five minutes, dip it in ice water to cool it down, let it dry, then put it in freezer bags to put in the freezer. On the 23rd, I got out and walked around the garden. I was amazed.. there was a cucumber that was yellow! Never even saw it. 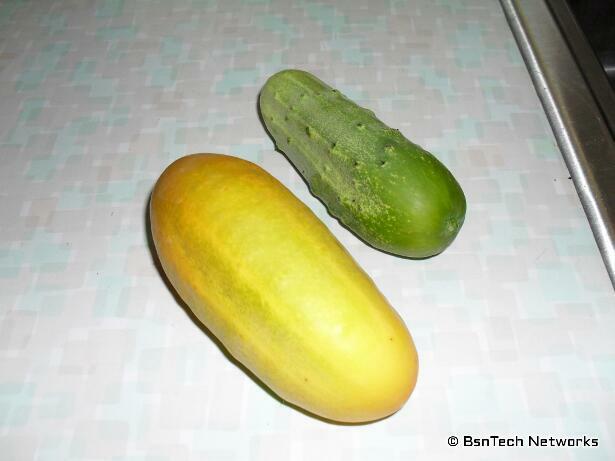 Both of these were Burpee Pickler cucumbers. On the 26th, more corn was picked. We got another 12 ears of corn. Some of these were not fully done – but yet they still are sweet. Now, it comes down to pictures that were taken today from around the garden. We also had a very nice harvest of tomatoes. We’ve previously also harvested quite a few – but today was the largest. 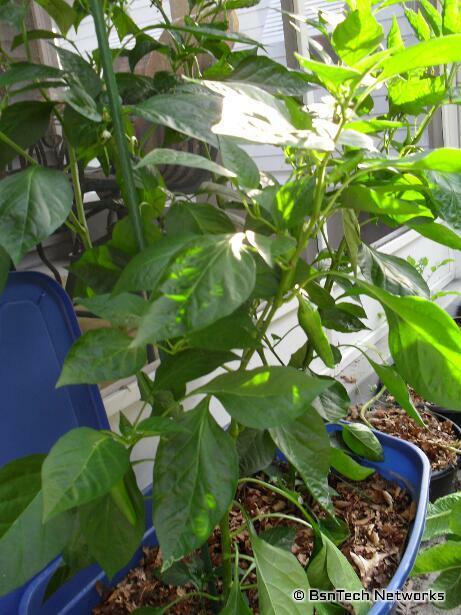 OK – so here is the Anaheim Hot Pepper by the patio. Not much has changed since the last photo. I did take about eight peppers off that were still green. They still seem to be rotting out right on the plant – so as long as they are picked before the entire pepper is consumed, they are usable. The radish seeds are just about done since they are drying up. With the weather in the high 90’s we’ve had, I’m not surprised that they are drying out. I’ll have quite a few radish seeds for next year. 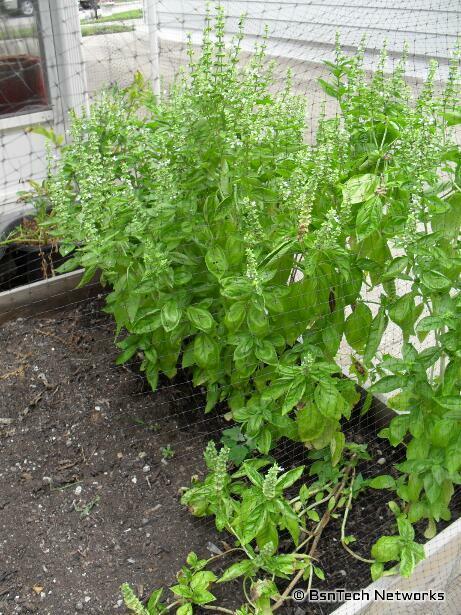 In addition, the single oregano plant seems to be doing well too – and is growing again. 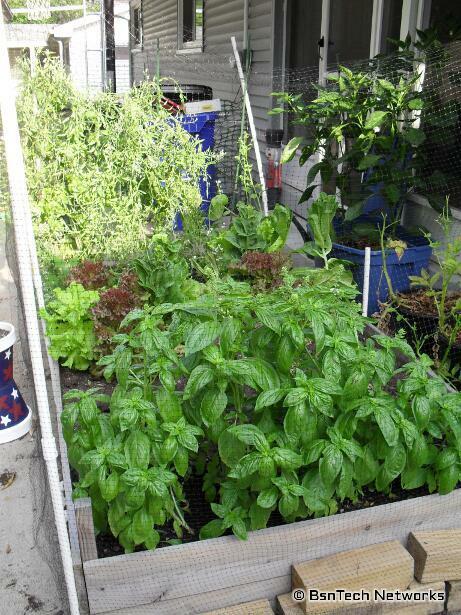 On the opposite side is the basil. This was taken before the basil was chopped. All of the plants had several flower stalks – so all of the flower stalks were chopped off – along with some leaves. After the choppings, I barely was able to fit them all on the dehydrator. Over to the side garden, I didn’t really take a full picture of it – only the watermelon area. 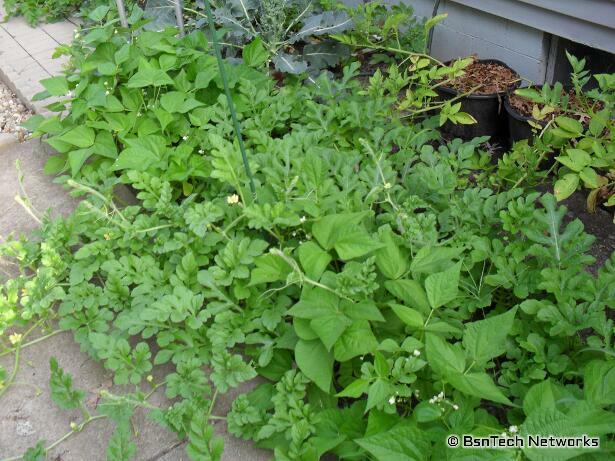 The side garden is looking pretty dead since there are just Yukon Gold potatoes in that area. It won’t be too much longer before it will be time to take all those out of the ground! Here is a closer view of two Crimson Sweet watermelon. Supposedly these should average about 24 pounds per fruit – but based on other reading, I’ve found that most home gardeners only get about 12 pounds out of each. I bet these are getting pretty close to that. In the back garden, the Kennebec potatoes look just as dead. The vines are dying back. 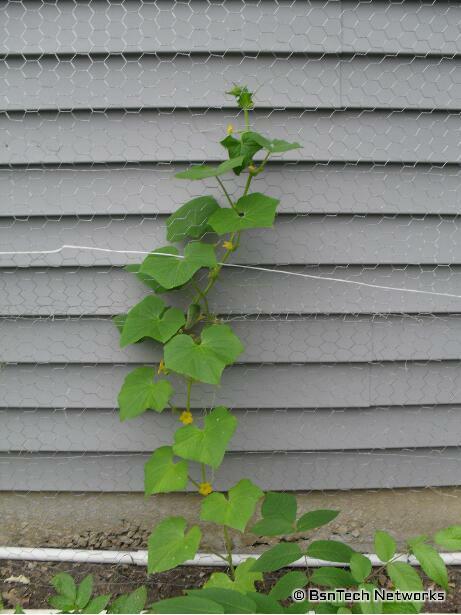 Also in the back garden is the five cucumber plants; two Burpee Pickler and three Little Leaf H-19. Overall, I think I may go back to the Straight Eight cucumbers. We still have several cans of pickles that were made last year – and they simply are not being eaten. 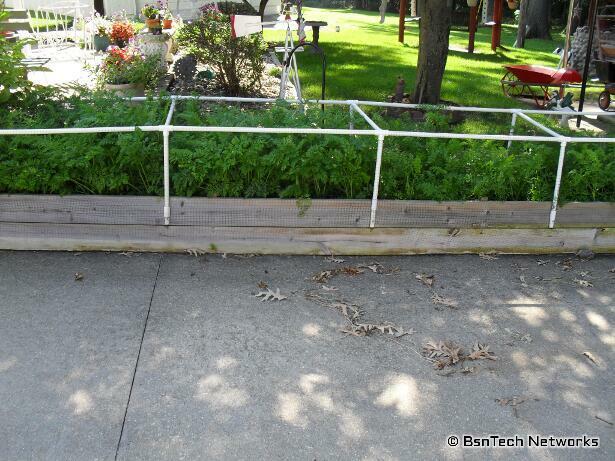 Back onto the driveway – carrots. According to my prevoius journals, it will be time to pick the carrots in about a week. 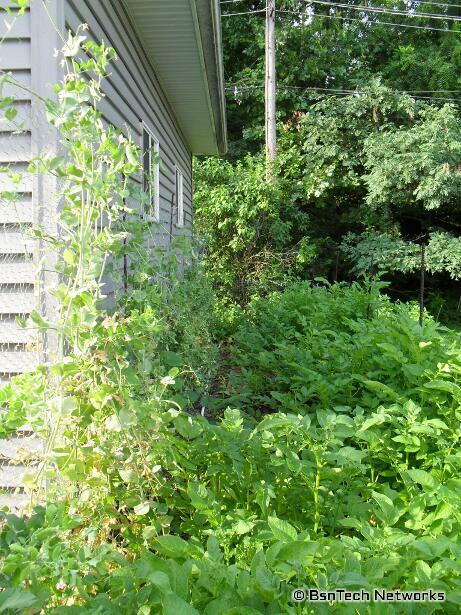 I did de-weed this area today and notice that many of them are peeking up through the soil – so it is about time! Next is the front area. The Tri-Star strawberries look awful. They looked bad last year about this time as well. I’m wondering if they go into some kind of remission during the summer because no matter how much water I give them, they don’t seem to do much. 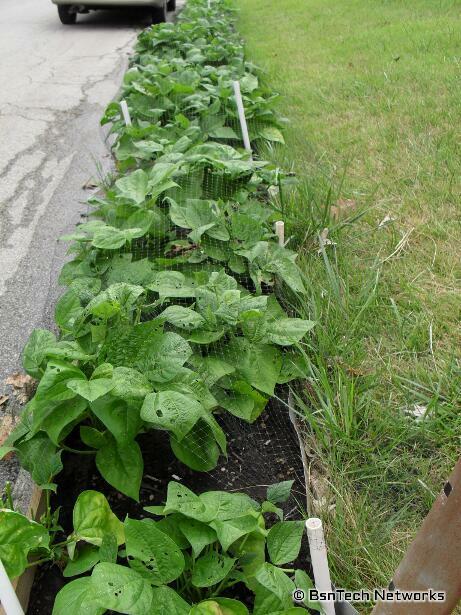 And the Bush Blue Lake 274 green beans that were planted in the flower bed. 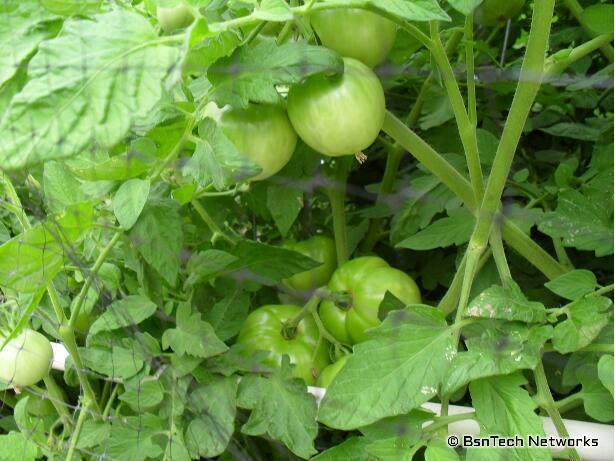 Two rounds were planted – and this shows the round that was planted earlier. There are finally some flowers and some small beans starting on them. 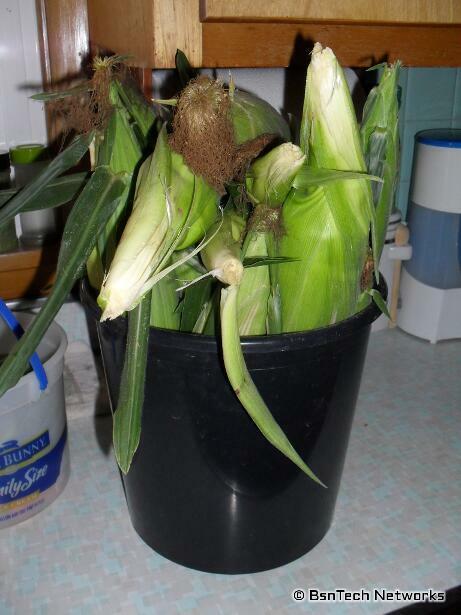 Here is the last remaining corn. All of them have an ear on them! Unfortunately I was not as dutiful this year so I didn’t put clothes pins with the date the silk emerged. It is usually said that once the silk emerges, the corn is ready to be picked in about 20 days. That is why the last batch didn’t look like they were done when I picked them; they were not given enough time to fill out. Cherry tomatoes! At least we have some this year. I only kept one cherry tomato plant from the seedlings.. and the deer at it down. Luckily it came back pretty good and is producing some. Over on the opposite side is the Better Boy tomatoes. 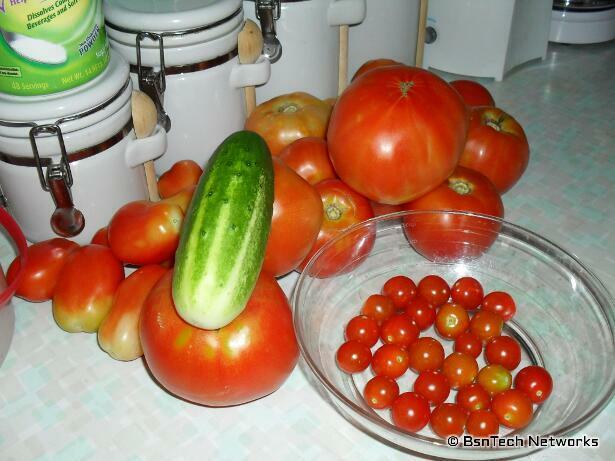 They are doing very good – and this was taken before I harvested all those large tomatoes. Well, that is everything in the garden. I failed to take a better picture of the California Wonder peppers in the front – but you can kind of see them off to the left side of the picture above. They still are quite small – but they do have a few small peppers on them. The “well” ran dry. Even though the rain barrel system can hold 660 gallons of rain water, it has ran out. I had to hook the hose up today and run some water into it from the house and fill the entire thing back up. It has been exceptionally hot over the past couple of weeks. We got a bit of a reprieve yesterday and today as the temps were in the mid 70’s or low 80’s. But, we’re going back up into the 90’s tomorrow and for the next week. It is even supposed to hit 96 degrees in a few days! Of course, that just means a higher water need. 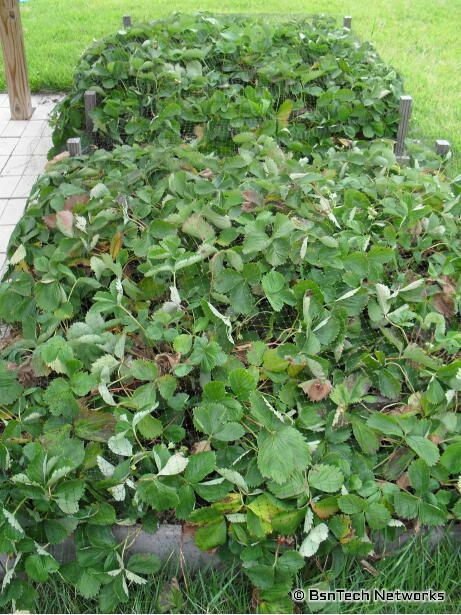 The strawberries were looking pretty bad – but finally got some relief today with some water. They don’t look terrible in this photo I took this morning – but after I arrived home today, they looked awful. 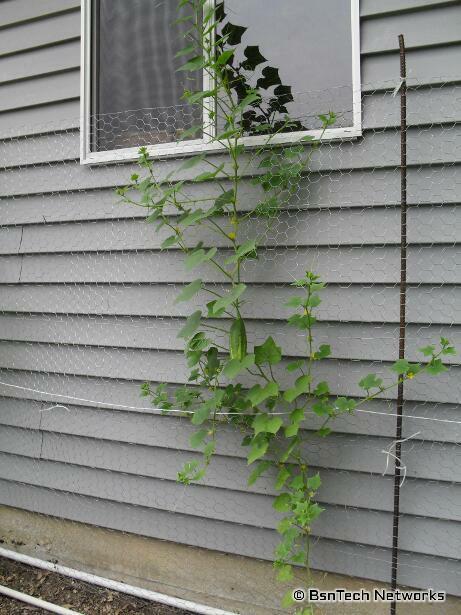 In other news – all of the Cascadia snap pea vines have been fully removed. I know it is time to remove them when the powdery mildew starts to take over. Of course, they also quit making pea pods too. So, the side garden is looking pretty bare now. 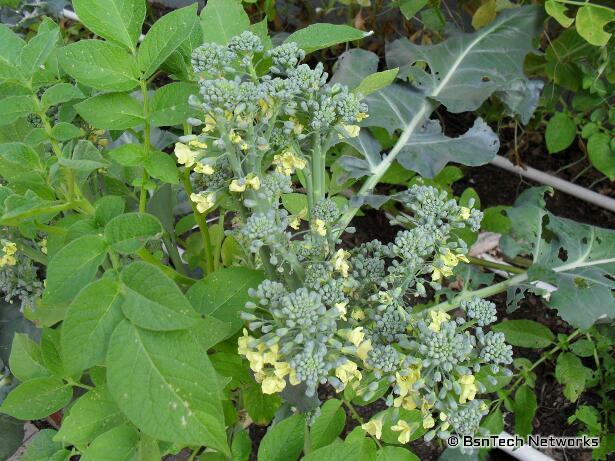 I’ve also removed the three last Green Goliath broccoli plants that didn’t produce well in the side garden – although this picture shows them. 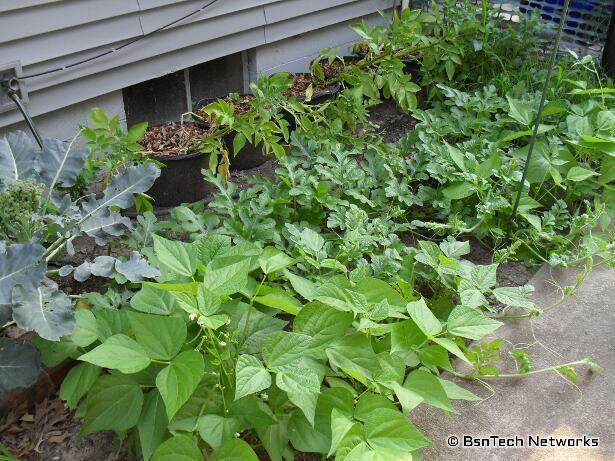 In the front, you can see some Bush Blue Lake 274 green beans and three Crimson Giant watermelon plants. What else is new? It is onion harvest time! Well, as in my previous post, I explained how you can tell when onions are ready to harvest. On the neck near the bulb of the onion, the top growth will begin to fall over. When it does this, you know it is time to harvest. 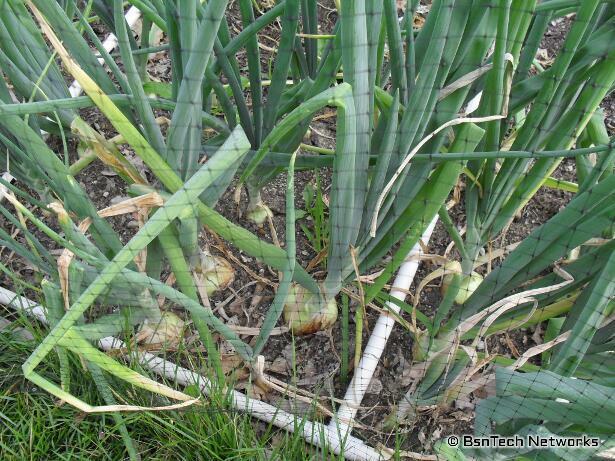 Or, if a lot of the tops start to die back – that means you may have some rotten onions. Yes, I so far have had about three Copra onions and one Varsity onion that was rotten in the ground that had to be discarded. But that is still much better than last year when there were a lot of rotten ones. Anyways, I’ve collected quite a few Copra onions. Onions definitely need a lot of light. 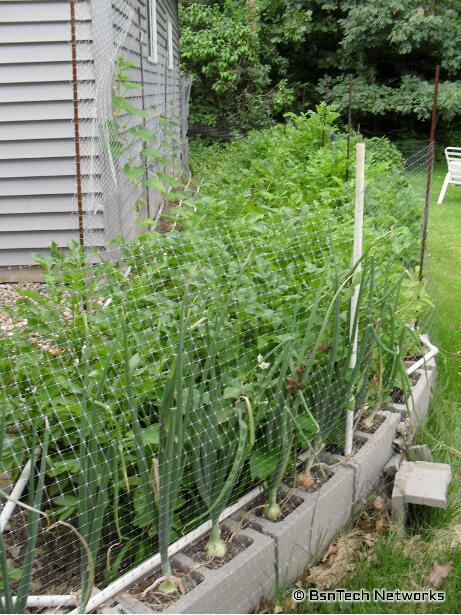 Those that I put in the cinder blocks at the back of the garage were getting crowded out by the potatoes – and needless to say, the size of those onions were probably half – if not smaller – than those in the front yard that had full sun. Now, compare that to the few Varsity onions that have been harvested. 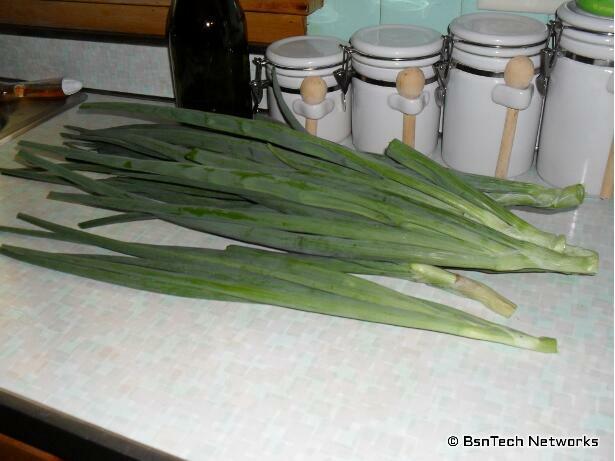 I so far am finding out that even though the Varsity onions didn’t have as long to grow, they indeed are larger! 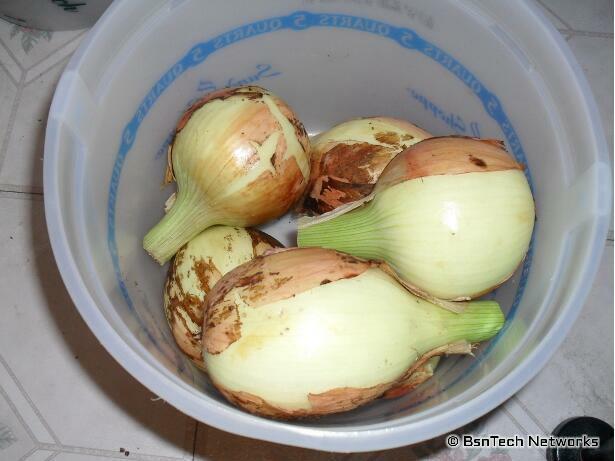 Well, I hated to see the tops to go waste – so the first harvest of onions were fully used. I cut the tops off and they were loaded into the dehydrator. It took about three days at 135 degrees to get them fully dried out. 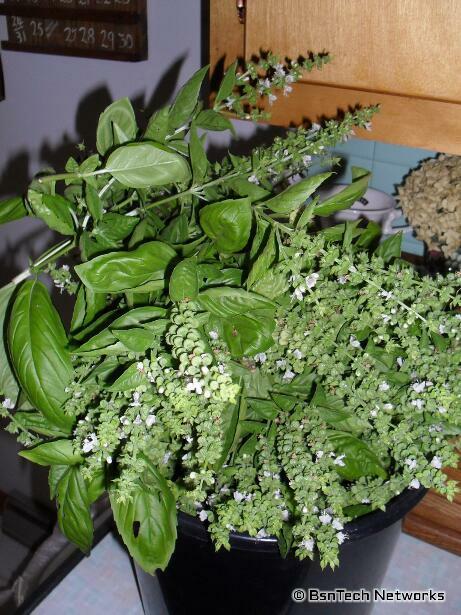 I then crushed them up and put them in an herb container – completely filled it to the top! I then used some on some potatoes that night – and it turned the olive oil and the top of the potatoes green. Was a nice garnish although there didn’t seem to be too much of a taste. Alright – well, let’s get started with the garden walk. 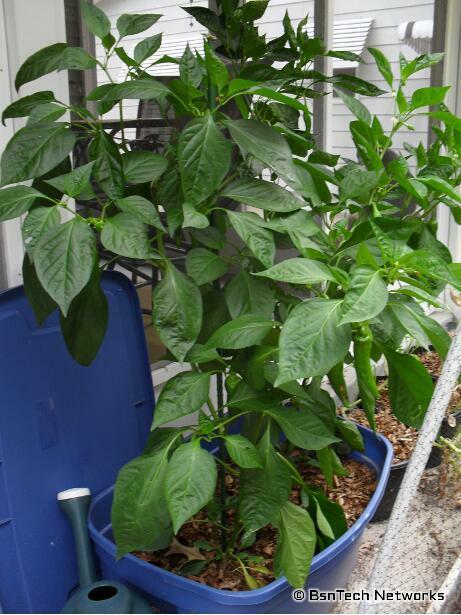 First up is the Anaheim Hot peppers growing in the container. 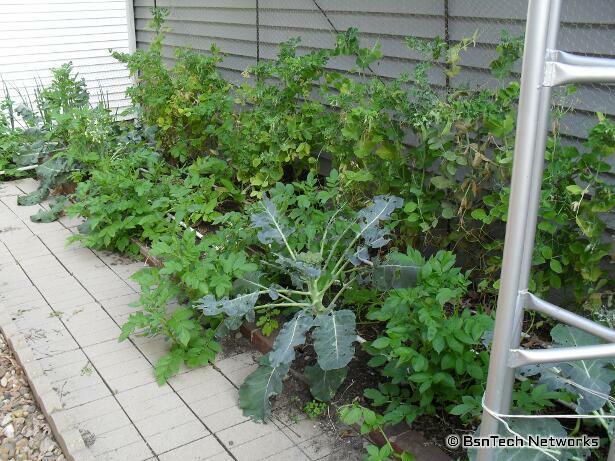 They continue to grow very well – but, I’m a bit concerned with some of the produce. 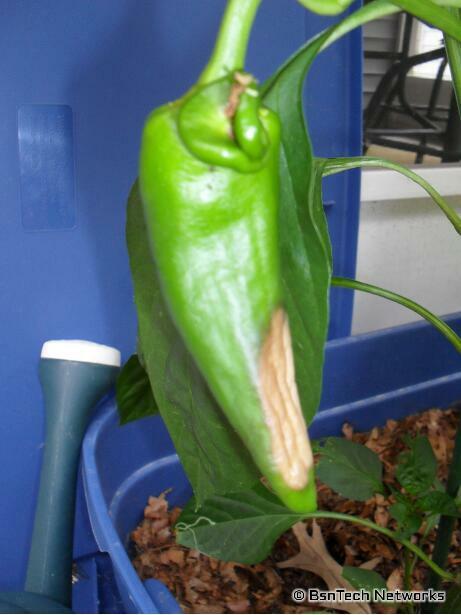 Just like last year, there is a mushy brown section that is on some of the peppers. 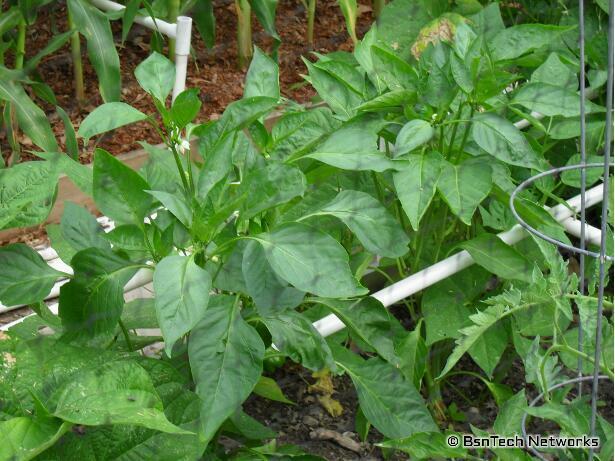 I’m not too sure what this is – but it was a problem last year and would rot out the peppers. The above one is pretty bad and I hate to pick it – but I may need to in order to save what is left. 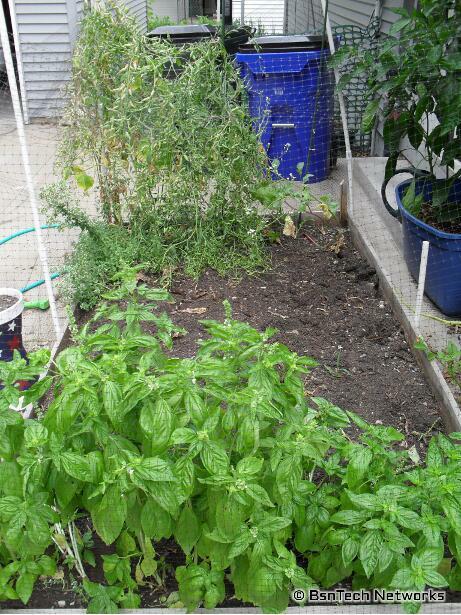 Moving on – here is the patio garden. All of the lettuce has been removed since it was no good. The basil is growing well – but because of the heat, they droop over and do not look good by the time I get home of an evening. The radishes are in the background. 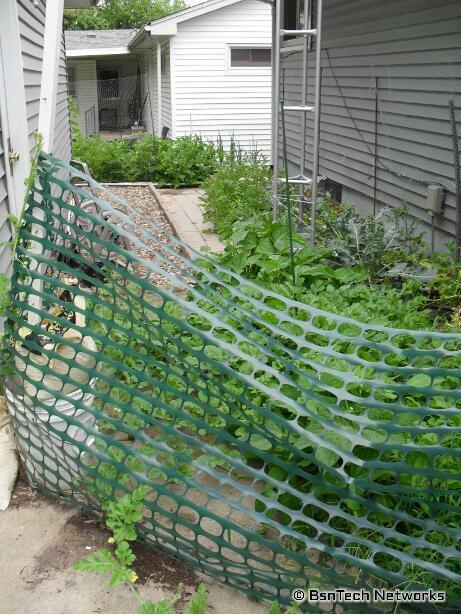 Of course, the radishes are not edible at this point. I’m waiting for the pods to fully dry up and then I can harvest the seed – so I’ll be able to have Easter Egg radishes for next year! Here is a closer look of those seed pods. Next is the back garden. Here is the full view. It seems that some of the potato vines are beginning to die back. See – no more peas in the above picture. You can actually see some of the cucumber plants! Well, here are two photos showing a comparison of growth. This first one is Burpee Pickler. Now, look at these small Little Leaf Pickling H-19 cucumbers. 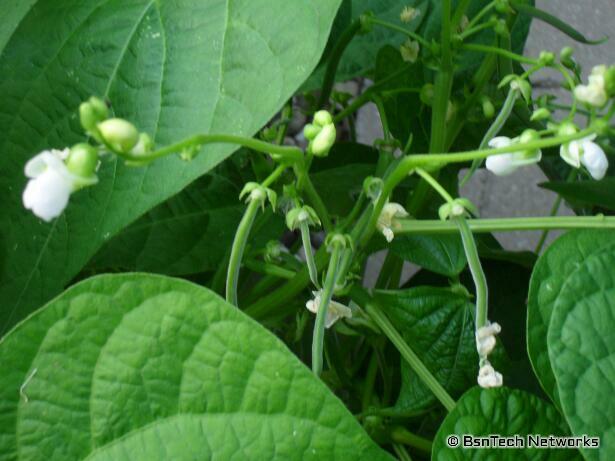 They are not a hybrid like the Burpee Pickler above – but they just are very small! Well, a quick view of the carrot bed and the Kennebec potatoes growing in the container. Not much going on here. And off to the front yard! 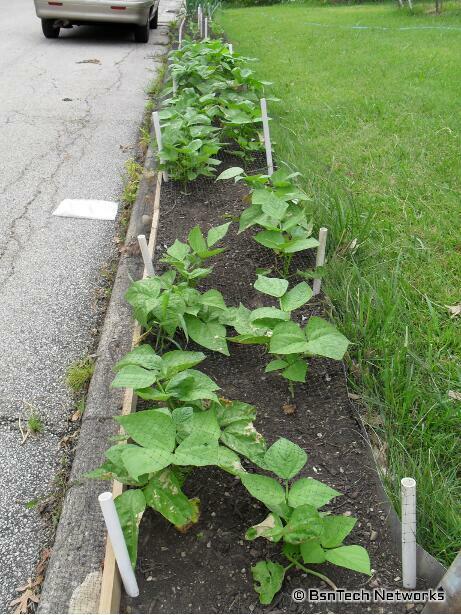 I planted another 50 Bush Blue Lake 274 green beans in the flower bed this past weekend. So far, about 17 have germinated as of today. I had to get more deer netting to fully cover all of them. I originally planted about 50 in this area – but didn’t have all of them covered. So, the deer got a free lunch. 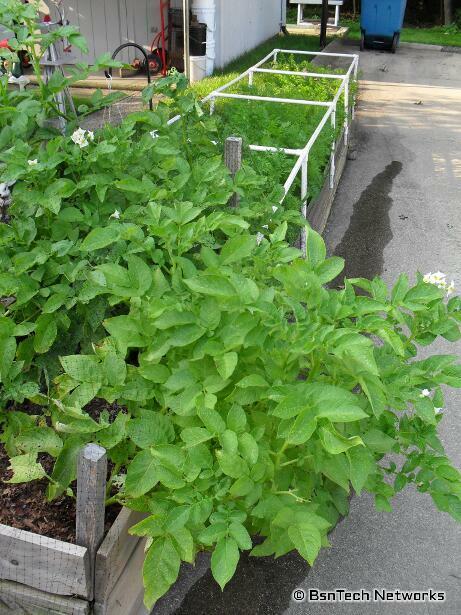 So far, we’ve only harvested green beans from about 20 plants – and have yielded about six pounds so far! That is already more than we had all of last year combined. 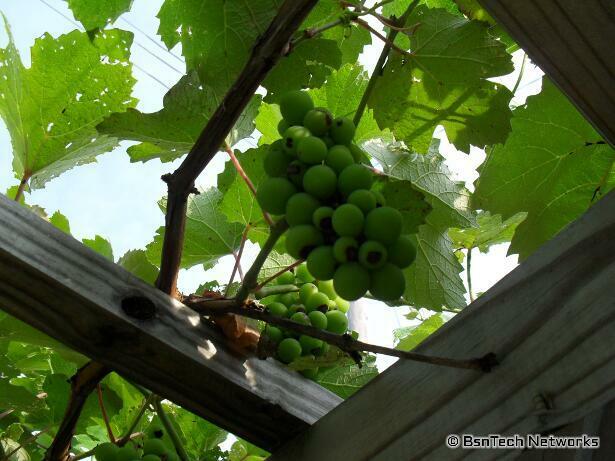 Over at the grape arbor, it is filling out quite nicely. And for the main garden in the front yard. Up front is the remaining Copra onions that still need harvested. A few more fell over last night since I’d previosly picked them – but others still are not ready yet. Most of all the celery has been pulled out – as you can see above. Some still remain – as I’ve let one go to seed so hopefully I can save some seed from it. Celery seed is so small, I’m not sure if I’ll be that lucky. But, the Honey Treat corn is still doing good! Some of it will be ready to be harvested in a few more days. So far, I’m still impressed with this variety and the number of ears it puts on per stalk. So, how are the California Wonder peppers doing? Well, they are growing a bit faster – but still are no where near as large as the Anaheim. And alas – the tomatoes. We have Best Boy, Better Boy, Roma, and Red Cherry tomatoes all in this big mess. 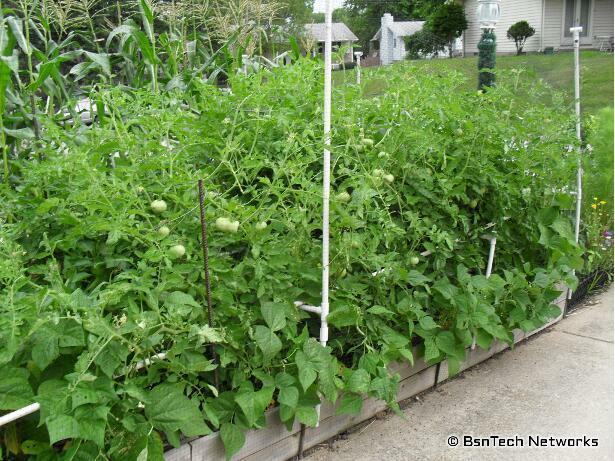 See all of the tomatoes! But not one of them is ripening up. 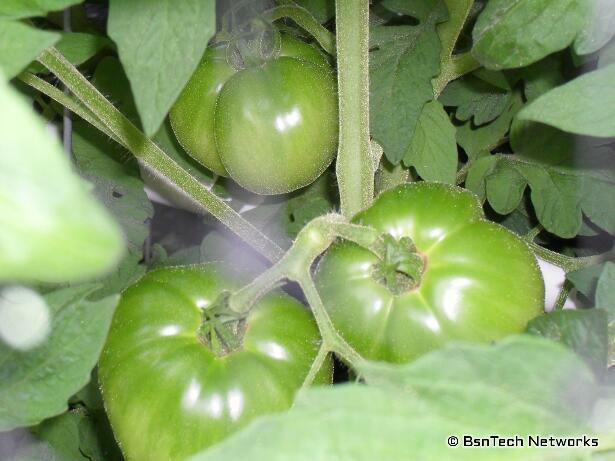 We are eagerly awaiting to pick some tomatoes to start our salsa making process. 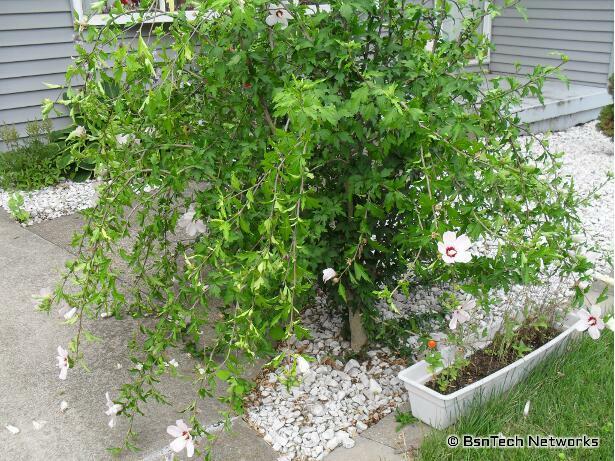 And lastly, we’ll close out with a photo of the Rose of Sharon bush in our landscaping. Until next time! 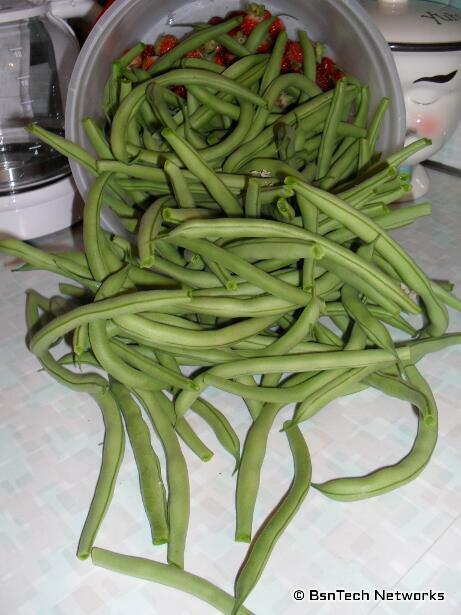 Just yesterday – we picked our first batch of green beans. Last year, we used the Greencrop variety – and they did terrible. This year, I went back to the old standby – Bush Blue Lake 274 – which did well the year prior. Out of maybe 15 plants, we got over two pounds of green beans! 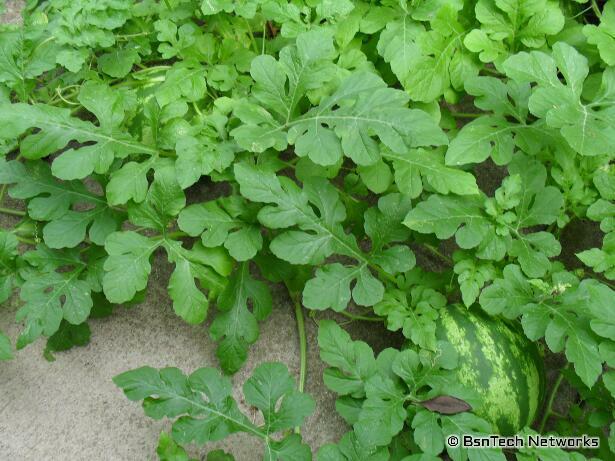 There were about six or seven plants in the watermelon bed in addition to another six or seven up front that were harvested. As you can see, there are also some strawberries in the back. We got another 9 ounces of strawberries on Friday as well. 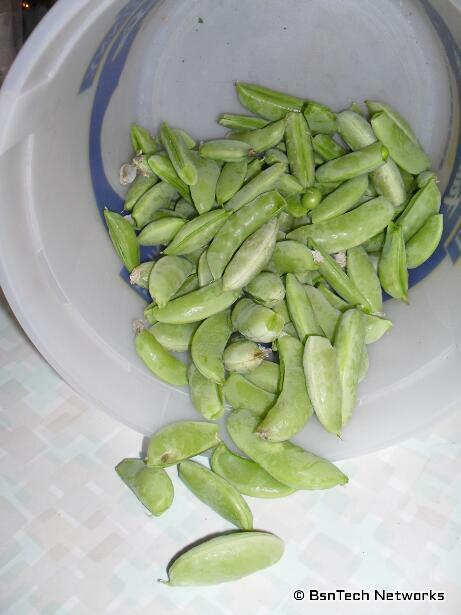 In addition to the green beans and strawberries, another pound of Cascadia Snap peas were harvested. It is kind of interesting – because in the past two weeks, there has been over five pounds of peas harvested – which is probably pretty close to what was collected for the other 1+ months! Unfortunately, the peas are getting powdery mildew pretty bad. The peas next to the house were pulled out a few days ago. So, the only thing that remains next to the house are the potato plants that were gasping for sunlight – and a few broccoli plants. 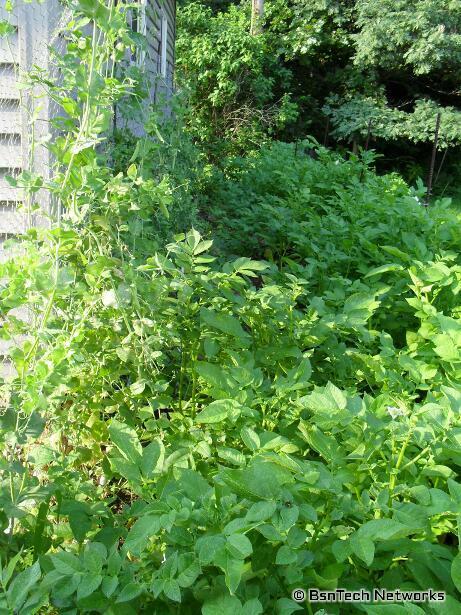 In the back garden, the potatoes don’t seem to be growing much more – but have made it nearly impossible to walk. 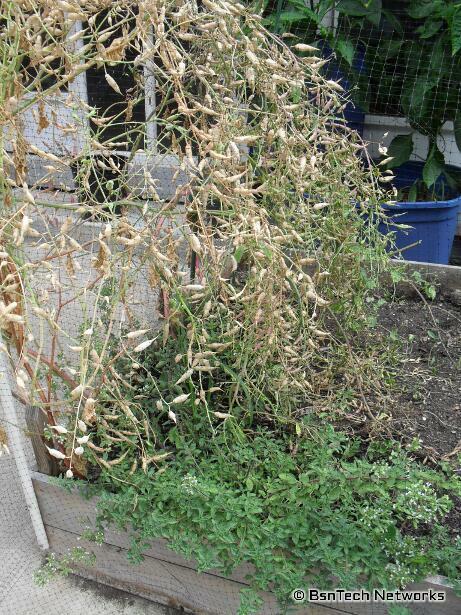 The peas back here are also looking poor – and they will probably get pulled out this evening after it cools down a bit. What else is new? The Crimson Sweet watermelon. 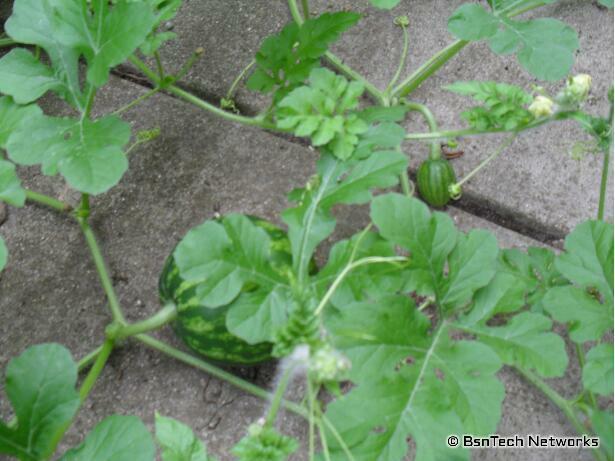 As I was pulling green beans last night, I saw a tiny watermelon that was beginning to start! 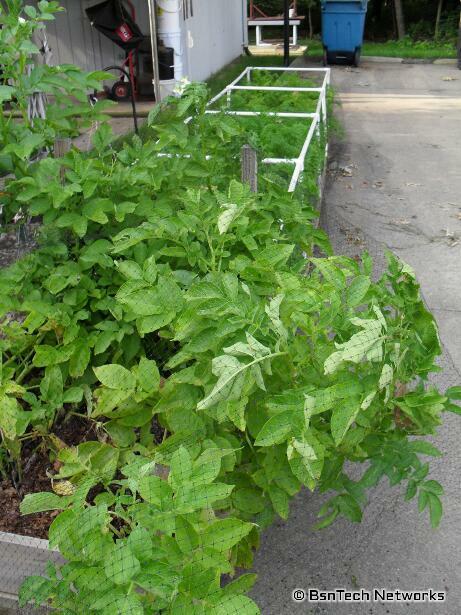 I didn’t get a picture of it – but it was sitting on the sidewalk because the watermelon have completely overtaken the 3 x 8 bed they were placed in – and have overgrown to the sidewalk as well. The Anaheim Hot Peppers in the tote are doing well. They grew exceptionally quickly – and there is at least a half dozen peppers on the two plants thus far – with another dozen or more blooms. The California Wonder peppers in the front garden are doing better now – but still not nearly as tall as the Anaheim peppers. 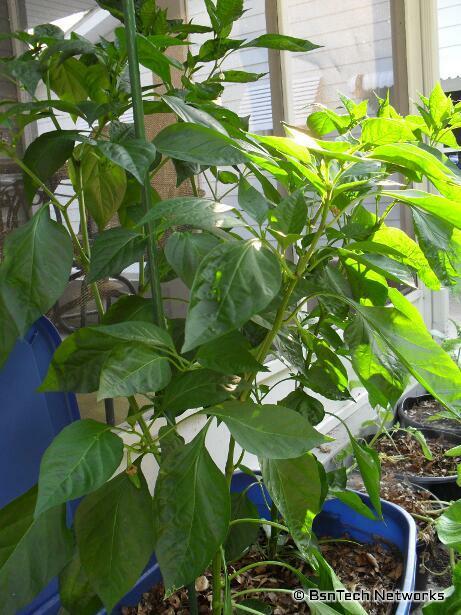 There is even some blooms on them as well – and a small pepper is growing on one of them. Didn’t get a picture of it unfortunately. Otherwise, the rest of the patio garden looks to be in dis-array. The basil is growing well – not as well as last year though – and the Easter Egg radish plants still have large seed pods that are maturing. Most of all the lettuce has been removed – but some remains. I need to get the rest pulled out because at this point, I don’t think any of it is edible. I probably need to get started on seeding the next round of lettuce for the fall soon as well. How about the carrots? Well, they’ve really moved right along as well. This is a closer look of the carrots. Those on the left are Sugarsnax and those on the right are Scarlet Nantes. Can you tell the difference? I certainly can; the Sugarsnax seem to be further along and are growing better. Going to the front yard. 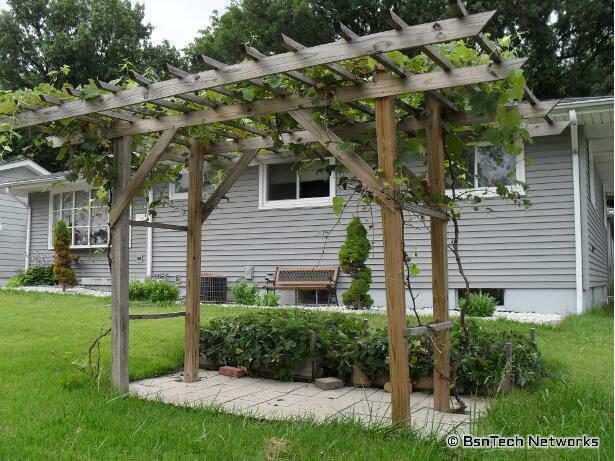 The grape arbor is overflowing with grape vines. Hard to believe that it is all from two vines. Here is a close-up of some grape clusters from the Flame Bunch grape vine. The corn is doing MUCH better than in years past. 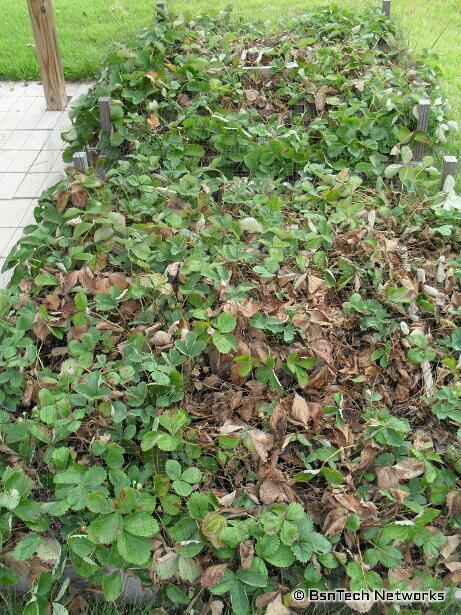 I finished filling out the bed with mulched leaves last weekend so the entire bed is now full with leaves to keep moisture in – and help to fertilize a bit. 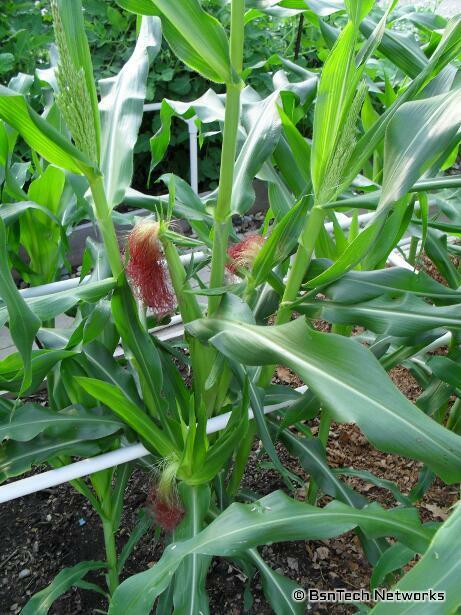 I went out and pollinated about 15 stalks – and many of those stalks put up a couple of different tassels. Out of the 15 stalks, there are a total of 28 ears that look like they may turn into something good! I’m sure hoping so. Still – it seems odd that this area had room for about 60 stalks of corn – and only 15 of them have been pollinated. It would be nice to fill this area with more green beans once the corn is done – but many stalks of corn were put in later and still have a ways to go in order to be fully mature. That would put green bean planting past the time where they would be productive. That is why I planted another 50 in the flower bed this morning. Unfortunately, the deer got to the original 50 that were in the spot because I didn’t have any extra deer netting – but now I’ve purchased another 100-foot roll of deer netting that should give me sufficient supply. Next is the tomatoes. I certainly hope I’ll be able to find all the tomatoes in this big cluster! They have grown so close together that the only tomatoes I’ve seen are those around the outside. 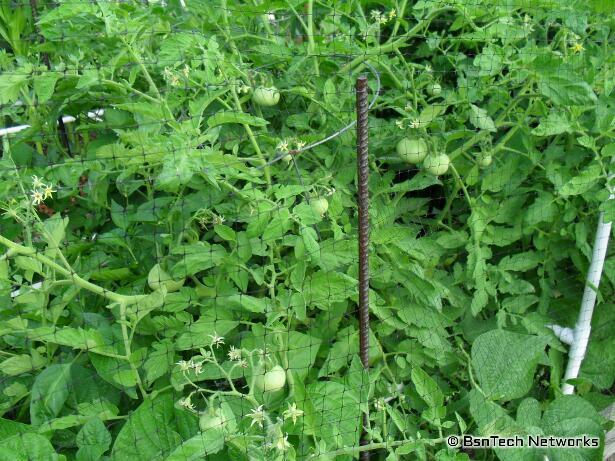 There are tomatoes on every single plant. And lastly – the Copra Onions. They have really bulbed up lately. 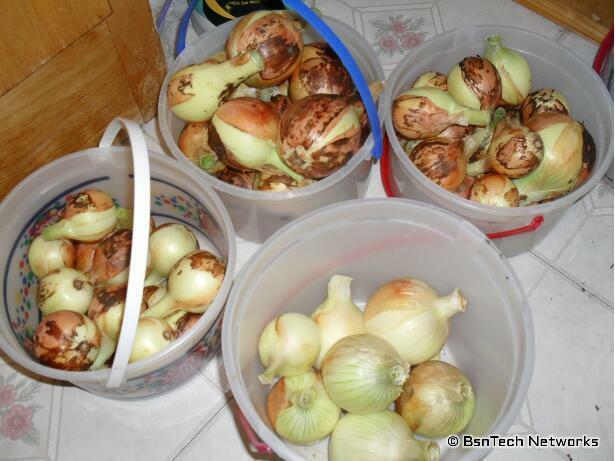 Many of them haven’t really provided much of a bulb at all – especially those that were planted in the cinder blocks in the back garden – but those in the back garden don’t produce well at all because the potato vines just take over the area and shade the onions out. 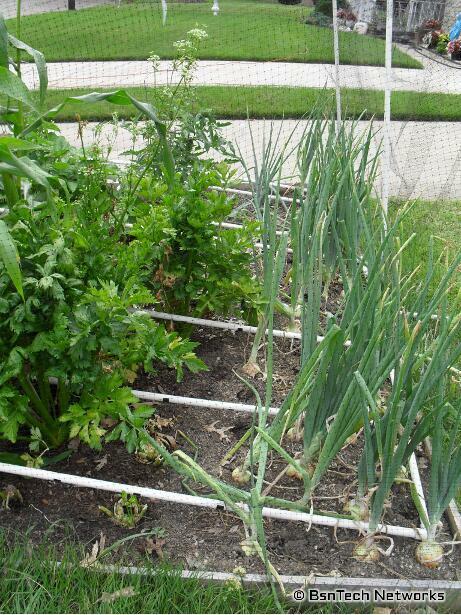 In reality, I just need to stop planting them back there – unless we harvest them as green onions going forward. As you can see, there are some decent sized onions in there. This is in the front yard where they get full sun all day. 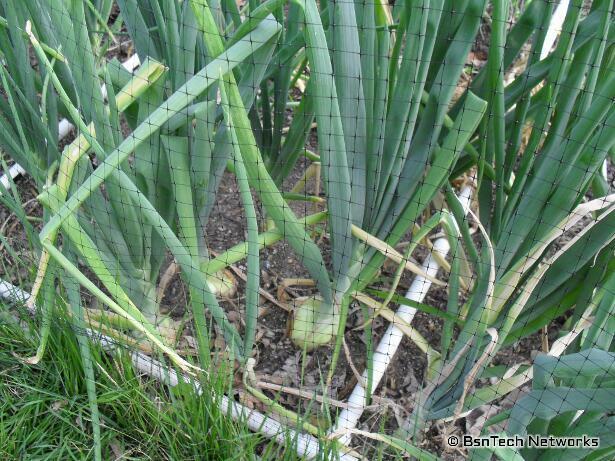 So – how do you know when to harvest onions? Well, simple! Onions are ready to be havested when the tops start to fall over. Well, what does that mean – when the tops start to fall over? Here is an example. Do you see the one onion “top” lying on the ground there? Well, what happens is this – when the onions are ready to be pulled out, right where the “leaves” attach to the bulb of the onion – the “leaves” bend over – much like in the picture above. That signifies that the bulbing is completed. It is really hard for me to believe that some of them are already falling over! The summer solstice is what causes onions to begin bulbing – and that is around June 21st. So it hasn’t even been 20 days and already, there are at least a half dozen onions that have “fell over”. That is all for this week’s garden checkup! 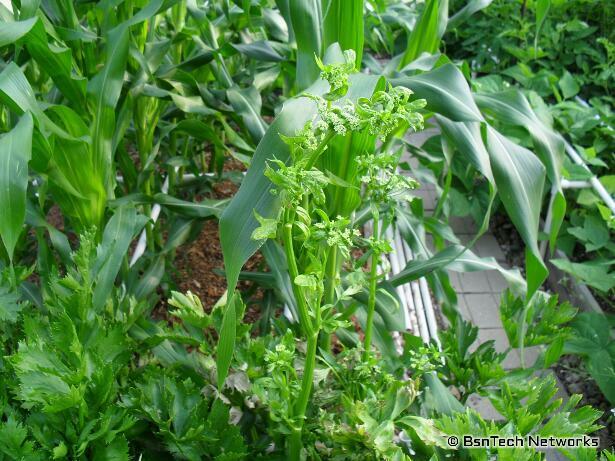 Bolting Lettuce & Celery, Corn & More! It has been two weeks since the last post. Nothing really interesting went on last week at all. 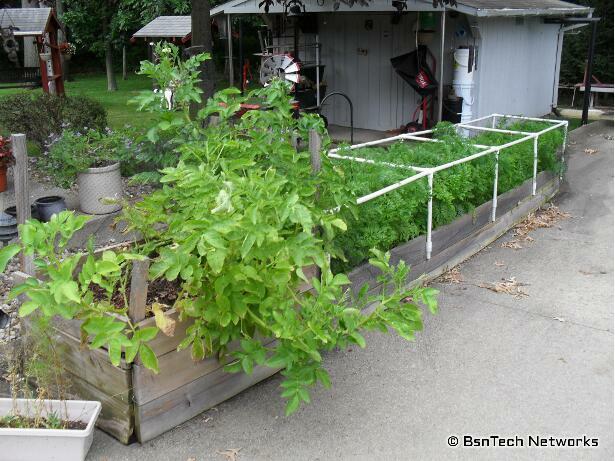 The weather was nice – in the 70’s and raining every other day – so the plants loved it and I didn’t have to water! But now it is back into the high 80s to 90s. A lot of the lettuce has been pulled out of the patio garden because they just got old or the temps were too hot. 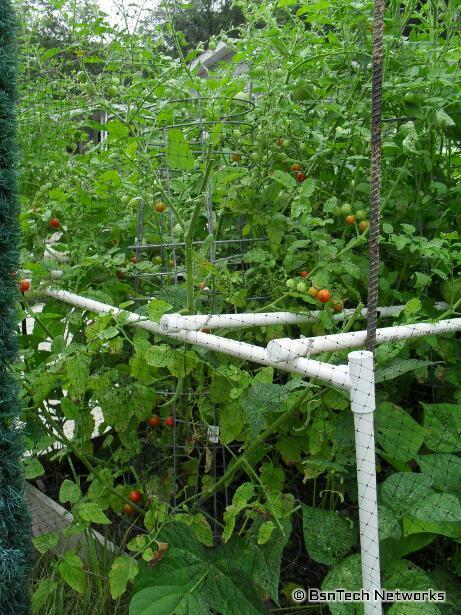 On the right-hand side, you can see one of the New Red Fire lettuce plants that is very tall and bolting. 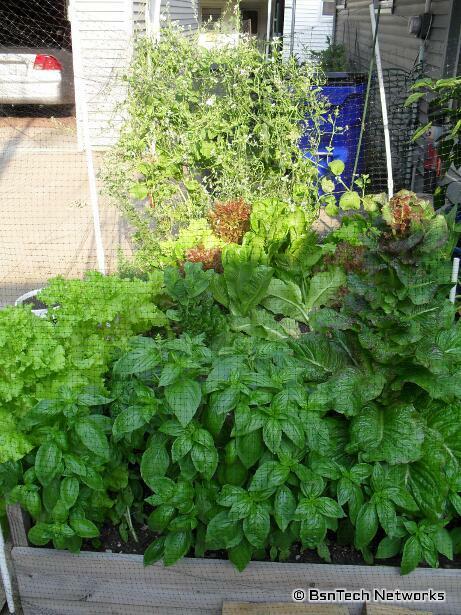 In the front is the basil and there are other lettuce plants still in. 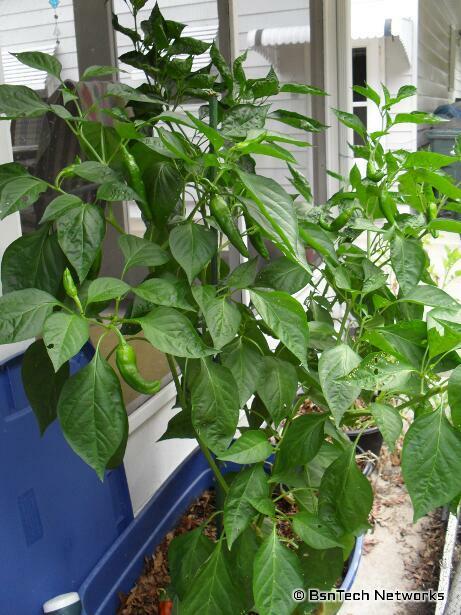 Over by the door of the patio is the two Anaheim Hot Pepper plants. They are in a large 30+ gallon tote. 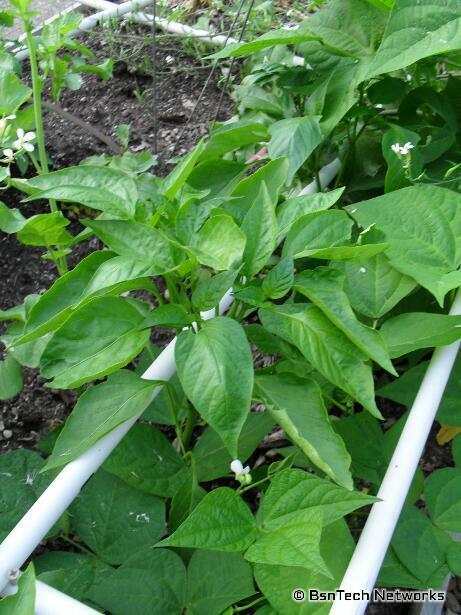 These two are very tall and looking good – and there even is a small pepper beginning to start on one of them. Compare that to one of the California Wonder peppers in the front garden that is maybe six inches tall. Moving on to the other bed on the driveway. This has some Kennebec potatoes in it at the front along with some Sugarsnax and Scarlet Nantes carrots. The Sugarsnax carrots definitely have grown faster than the Scarlet Nantes. Time will tell to see the quality of the carrot and whether buying the more expensive hybrid Sugarsnax is worth it. 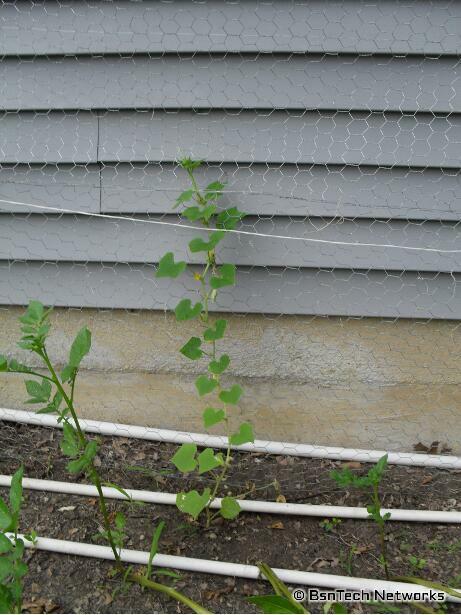 Over in the side garden, the Cascadia Snap peas are finally succumbing after providing some sweet, tasty peas. 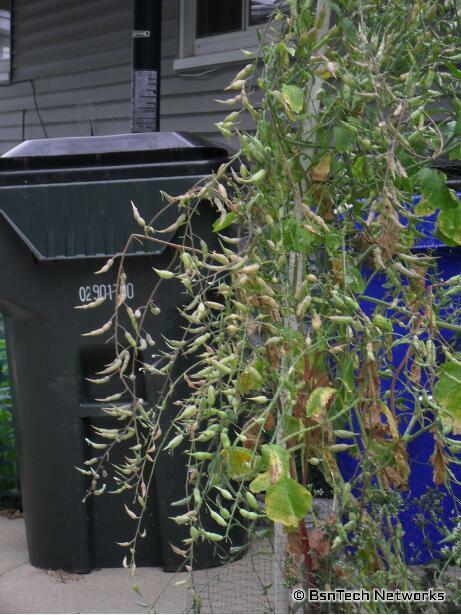 I picked two pounds of peas just a few days ago – and there are still more that need to be harvested. 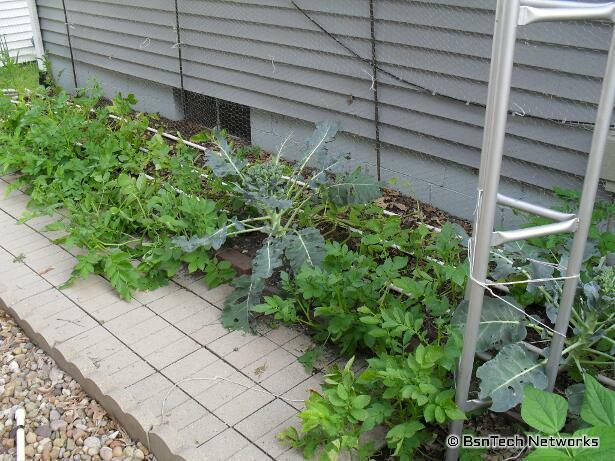 All of the cauliflower has been pulled out and only a few broccoli plants remain. The rest of the vines you see are from the Yukon Gold potatoes. See a little bit of yellow color there in the back? Yep, one of the Premium Crop broccoli plants had the main head cut off – and it put up some side shoots. I never got around to cutting them and so it is flowering. And just to the left of this area is the watermelon bed. The Crimson Sweet watermelon have taken over the entire area and the Bush Blue Lake 274 green beans are really doing well. 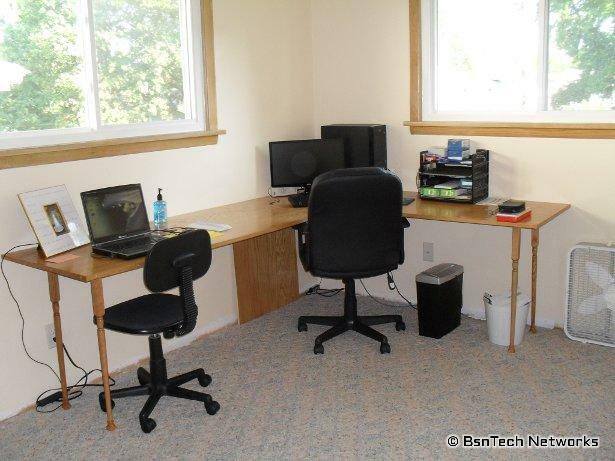 You can also see some potatoes in small buckets as well in the back. The back garden is almost to the point where I no longer can walk through it! The potatoes have really taken over. 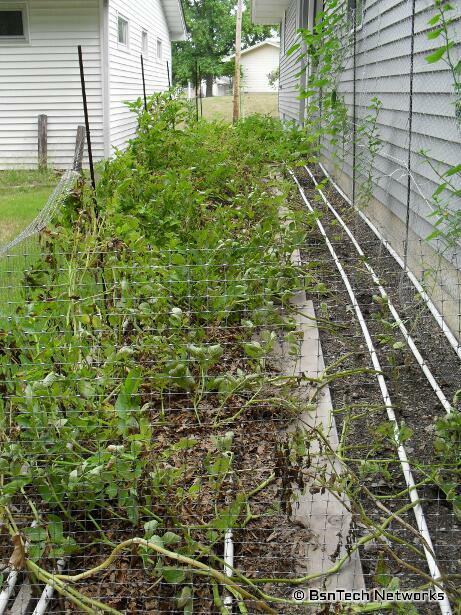 The peas back here have also begun to die off as well. 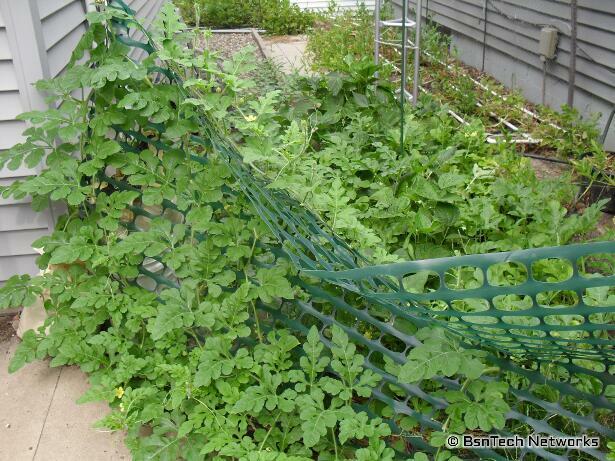 There are five cucumber plants in this area – but they are hidden pretty good and haven’t sprung up quite yet – making them impossible to see. Now – the front garden. Things have really taken off up here! 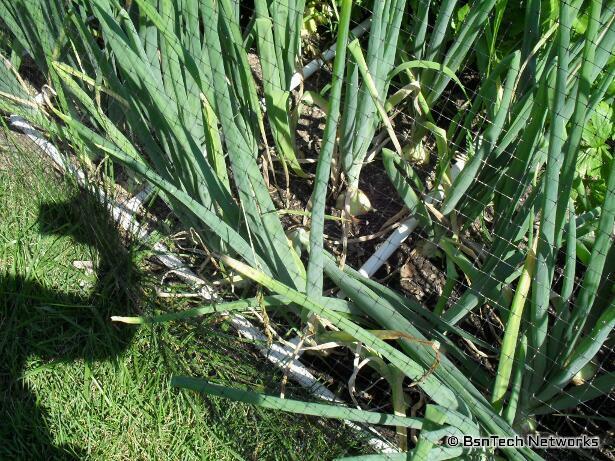 The Copra onions are really beginning to bulb up, some of the corn is beginning to shed pollen, the green beans are still trying to fight for sunlight, and the tomatoes have really taken over! Note to self – planting tomatoes two feet apart from one another in each direction is WAY too close. Take a look at one of the Ventura Celery plants – it is also bolting and has a flower head on it as well. 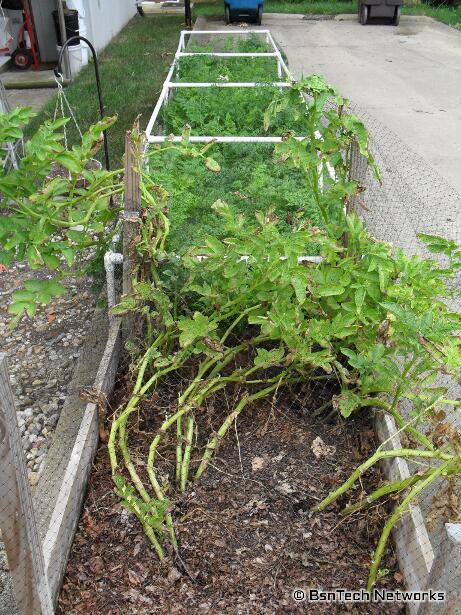 We have harvested a bit over half of the celery so far – and two of them rotted in the ground. 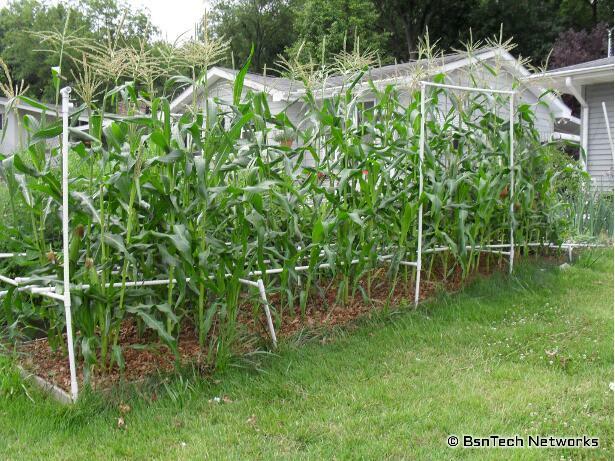 Here is a back view of the Honey Treat corn area. 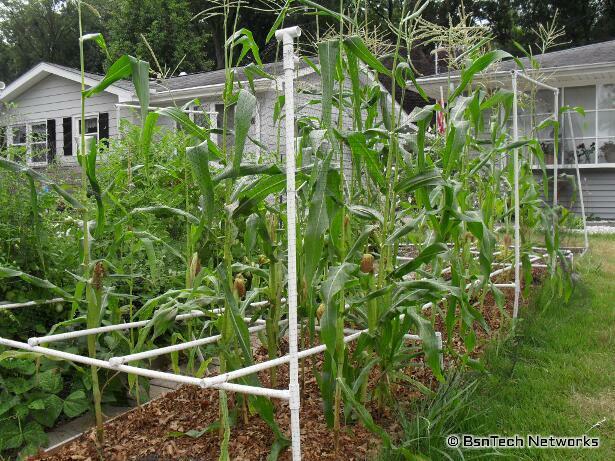 Unfortunately corn was planted four different times because it simply did not sprout well. Much less than 50% germination between all the times that they were planted. Take a look at this! There are THREE ears of corn starting on this one plant! Last year I tried to grow Sugar Dots corn in this area and it failed horribly; growth was stunted and we might have got one ear of corn for every two plants. 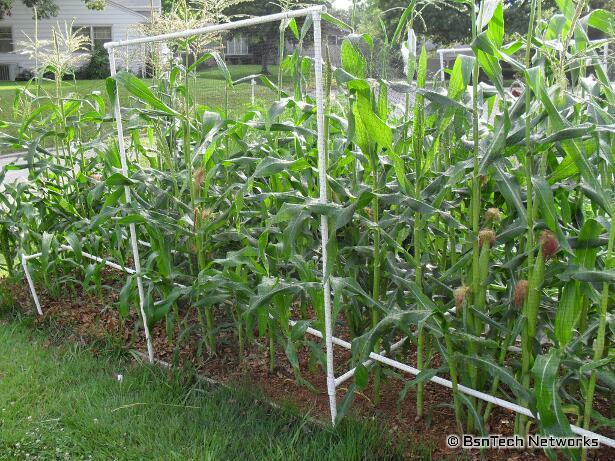 This year – the corn is doing well! 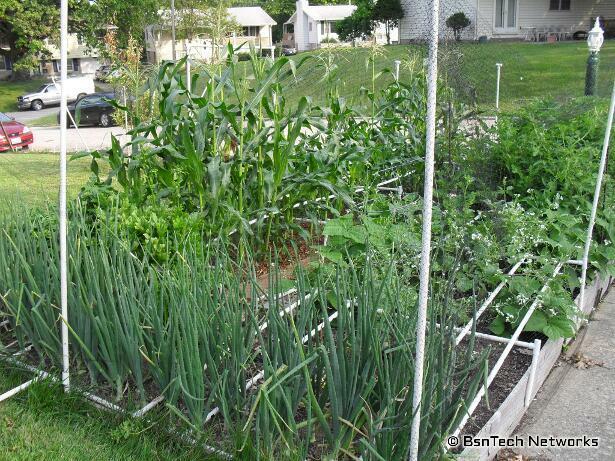 I put in a good layer of mulched-up leaves and tilled it in last fall – then placed another good layer directly on the soil after the corn was out of the ground. 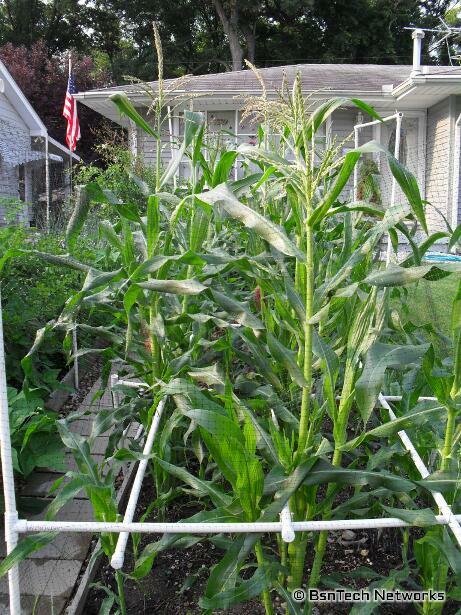 Also used some pelletized fertilizer – which I don’t like doing – but I wasn’t going to have a failed corn crop this year. But THREE – that is the best I’ve had yet. 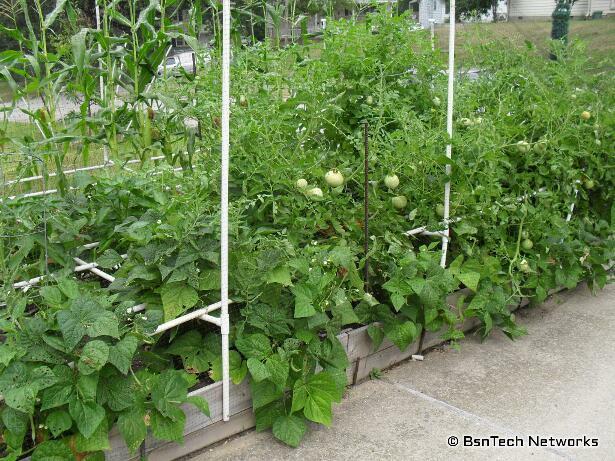 Nestled over by the tomatoes, the green beans are trying to fight for sunlight. Many of them already have little green beans started. 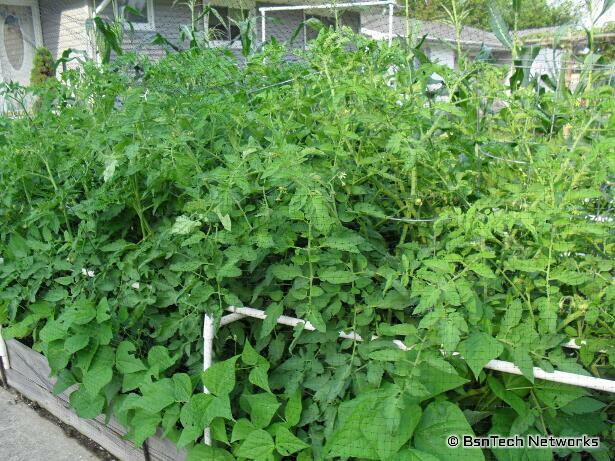 And look at the mess that these tomato plants are in! There is zero space between all of them. There are quite a few small green tomatoes starting on them though – so I can’t wait until we start to get some good tomatoes out of the garden! This picture below is from one of the plants I had to buy – Better Boy. And that just leaves one picture left. 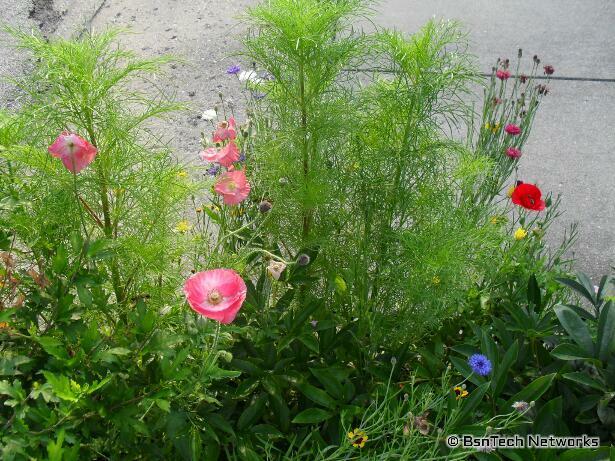 My wife planted some wildflowers down at the curb of the road and our driveway. There is a pretty nice selection of colors and flowers that look pretty nice. The flowers are pretty tall, but do look nice.